OpenCart Mobikul Delivery Boy App - Opencart Delivery boy app is meant for better management of the delivery process. It helps the admin to manage the order. The app offers separate login for the admin and delivery boy. The admin can view the sales and the orders of the store on a daily, weekly, monthly and yearly basis. On the change of the status of the order by the delivery boy will be visible to the admin. Whereas the delivery boy can even log in and view the assigned delivery of the products. This will eliminate any confusion that may occur in the delivery of the products. The delivery is authenticated by the One time Password which will be provided to the customer. Only the authorized OTP will work, and the status will be changed to completed. Please Note - This application is an add-on to Mobikul Mobile App, you must have Mobikul OpenCart Mobile App. The delivery process can now be no trouble for the store owner as now the process can be closely monitored by it. The admin can register the delivery boy and assign them order for delivery. The assignment can be done as per the availability of the delivery boy. The delivery boy can view the delivery assigned and change the status of the order after completion of each step. 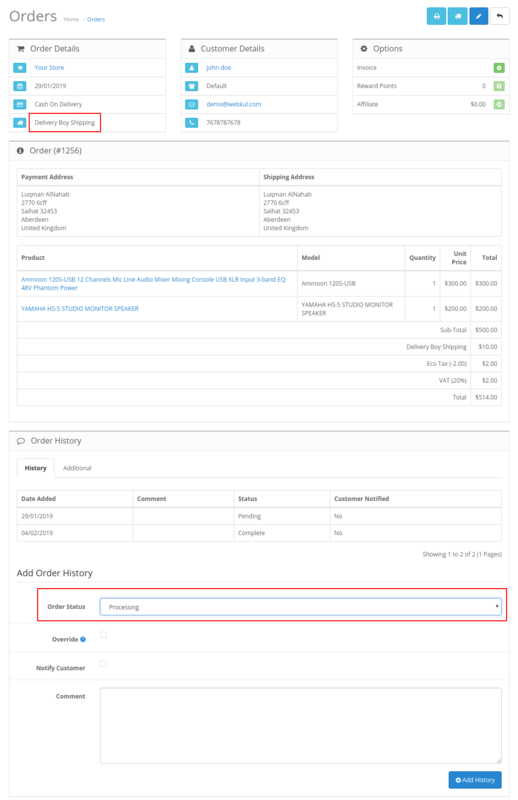 The customer can now track the order under order section in the Opencart Mobile App. How will this app benefit your business? One of the significant inefficient parameters which most of the e-commerce website encounters is in shipping or logistics management. There may be cases encounter of the delivery not received or packages delivered to wrong fraud customers. With the eCommerce becoming a new establishment day by day. There is a need to streamline the process of the shipment and logistic process which can be accomplished with this app. This app will let the admin distribute the orders among the different delivery or logistic guy. Each Delivery boy will be able to manage its orders. Most importantly, the app allows the delivery boy to authenticate the delivery process through OTP. The delivery boy will be able to get the statistic based on the graphs for sales and orders. The order separation based on the order status like Pending, Processing and Complete order. The Delivery boy will be able to view orders assigned to him. The shipping validation through OTP so that the delivery will be received to the right customer. The delivery boy can see the details like the Vehicle Number, Email Address, Vehicle Type, and Contact Number. The Delivery boy can set the “Online” or “Offline” status for the delivery. The admin can efficiently manage the orders with the help of this application as the orders with the delivery method selected as “Delivery Boy Shipping”. These orders can be distributed among the delivery boy by the admin. The admin can assign or reassign the orders to the delivery boy. The admin can manage the assignment based on the availability of the delivery boy. If the admin requires can set the order status from pending to processing from the backend. The admin can manage the sales and the view the sales graph of the orders. The customer has a very effective functionality where a customer can track the delivery boy. This keeps the customer updated and satisfied with the product delivery. The customer can track the order in the order section of the Opencart Mobile App. The customer can track the orders on the map which helps customer trace the delivery boy. The order shipments complete when the customer provides the OTP. The Admin can create new delivery boys. Admin can manage delivery boys details and assign delivery to them via the app. Admin and Delivery boy both have separate login in the same app, to manage the delivery process. Admin can view the status of delivery as set by the delivery boy. That is any changes done in the order status by delivery boy gets reflected in the admin panel. The app can even work in Offline mode. OTP authentication for verifying the customer. The delivery boy needs to enter the OTP for verifying the delivery and completion of shipment. The customer will get to track the delivery process under the orders section in Opencart Mobile App. Real-time order synchronization with the web store. Flutter Mobile App is fully customizable as per your requirements. Flutter Mobile app source code is available (Purchased Separately).